Care2 Causes | Andrew Wakefield Resigns From Thoughtful House: Is Vaccinegate Finally Over? Andrew Wakefield Resigns From Thoughtful House: Is Vaccinegate Finally Over? It’s beginning to look a bit, and maybe a lot, like “Vaccinegate”—if I may so dub the whole furor-tinged controversy surrounding claims that vaccines might be “linked” to autism—may be coming to its inevitable finale. Two weeks ago it was announced that the 1998 Lancet study linking the MMR vaccine to autism published by Andrew Wakefield et al. had been retracted by that medical journal. The week before, the UK’s General Medical Council had ruled that Wakefield was “unethical” and had acted “dishonestly and irresponsibly” in conducting his research. The needs of the children we serve must always come first……All of us at Thoughtful House are grateful to Dr Wakefield for the valuable work he has done here. The “important work” done at Thoughtful House, which Wakefield helped to found in 2001, is to “[fight] for the recovery of children with developmental disorders through the unique combination of medical care, education, and research.” Thoughtful House is one of a number of centers and clinics that use biomedical and alternative medical methods to “treat” autistic children. The safety—not to mention the efficacy, the usefulness, and the necessiry—of many if not most of these treatments (such as chelation) have been the subject of much dispute. The use of biomedical and alternative medical treatments has yet to be supported by conclusive scientific evidence. Was Wakefield “pushed out” of the Board of Directors of Thoughtful House, as Orac writes on Respectful Insolence? Is it possible that the purported link between vaccines and autism is withering away, to take its place in the annals of Really Wrong Ideas About What Causes Autism, right next to Bruno Bettelheim‘s widely discredited claims that bad “refrigerator” parents caused autism? Actually, based on the news of the past few weeks, I’ll warrant that “Vaccinegate” has already achieved such historic, has-been status. There’s more on the broader vaccine issue from Suzi Parrasch here. 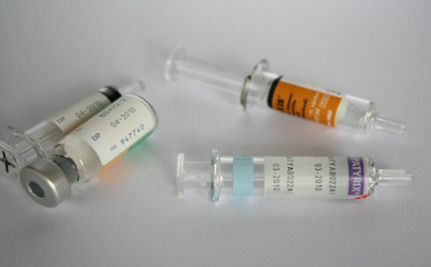 Photo of syringes by I woz ere. Google,' The Complete Deconstruction of The British Medical Journal/Brian Deer false allegations against Dr Andrew Wakefield aired Jan27,2011 on Dr GaryNull'sShow.British Medical Journal & The Lancet wedded to Merck CME partnership. ProgressiveRadioNetwork*cm.www*knowshots*com. Healingourchildren*net. Google,'Do Vaccines Disable The Immune System? by Dr Randell Neusaedter. Google,'CDC Concedes Secretly That Vaccines Have a Link To Autism.' YouTube Dr Maurice Hillerman Censored Interview. YouTubeVideo,'The TruthAboutVaccines.' See the movie, 'In Lies We Trust.' on YouTube or Netflix. See The Movie,'Vaccine Nation.' on YT or NF. See the movie, 'All Fall Down-CCHR' on YT. also, see 'Guinea Pig Kids' on YT also the movie,'Vaccination-The Hidden Truth.' Google, 'US Government Wants To Test Anthrax Vaccines On Children.' wwwdtldsfreedomforum*cm www*newslettertree*cm. Truthfrequencynews*cm. www*vaclib*org. www*healthfreedomportal*org Google,'US Goverment Infected Guatamalans With Syphillis.' lookup measle vaccine ingredients. Rense*cm Get off The 'LameStreamMediaTrain & realise all they care about are PROFITS! NOT HUMAN HEALTH. Thanks for the propaganda piece Care2 but I'm not buyin it! Peace & Love to all Truth Seekers out there & *Don't Drink the Koolaid! Parents of autistic children kept pointing out the fact that their childrens heavy metal toxicity profiles showed high amounts of aluminum, and they wanted to know what that meant. "You need to know why you have been led so far from the path of truth. You need to know that when you see media reports that promote the good of vaccines and their effectiveness, such as news or television reports, that these reports are completely fake and fabricated. Loving our children means not giving them vaccinations and it means that we need to inform other parents as well that vaccines are indeed shown and proven to be deadly." There is no evidence for the so-called "vaccine-autism" link, other than vague conspiracy theories about "Big Pharma". Meanwhile, the resulting anti-vaccine panic has cost and continues to cost lives. I know this is off the subject, but if you will just take a moment to look at my Petition-I would appreciate it kindly. Thanks! Terrific Logic, Ali! Point made! Ali, I was saying that for emphasis. That even in the worst-case scenario, even if every single condition was caused by vaccines, I would accept the verdict. I was saying that even if the facts reveal something that I REALLY wouldn't want to exist, I would accept the findings of science. Of COURSE no sane person is saying that every single case under the autism spectrum is caused by vaccines. "If the best evidence eventually shows that every single condition under the autism spectrum is caused by vaccinations, I will regretfully accept that finding." "If the best evidence eventually shows that every single case of paraplegia is caused by road traffic accidents, I will regretfully accept that finding." Otherwise what? You won't believe that *any* paraplegia is caused by road traffic accidents? Many things in this world have multiple causes. Life isn't always black and white.